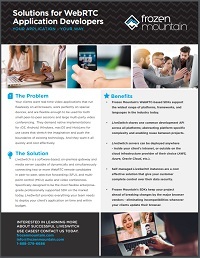 Your customers want to add peer-to-peer and multi-party video conferencing capabilities into their new or existing application, however they need them seamlessly integrated on a wide range platforms with advanced features such as session recording, video-to-telephony SIP bridging, screen sharing, and more. Your boss needs you to provide tools that will reduce the iterative time needed to refactor and maintain your live video codebase for each new platform - be it Windows, macOS, Android, iOS or others. Your team wants the most comprehensive development API with deep access into the media pipeline and flexibility to create and destroy peer-to-peer, SFU, or MCU connections seamlessly whenever needed. LiveSwitch allows you to integrate server-based multiparty WebRTC audio/video streaming into your application - your way. Using LiveSwitch, you can add real-time communication to any application on virtually any platform. With server platform support for Windows 2008+ and Linux, and client platform SDKs sharing a common RTC API on Windows 7+, macOS 10+, Linux (Ubuntu, Debian, Fedora, ...) , iOS 8+, Android 4.4.4+ and more, developing one application for multiple devices has never been easier. LiveSwitch includes all the power needed for multiparty WebRTC media streaming and signaling in one complete package, ideal for server-based real-time applications.